Automatically document your SQL databases with SQL EasyDoc. All editions of MSSQL server are supported. Output to DocX, HTML, PDF fully customisable and white labeled. 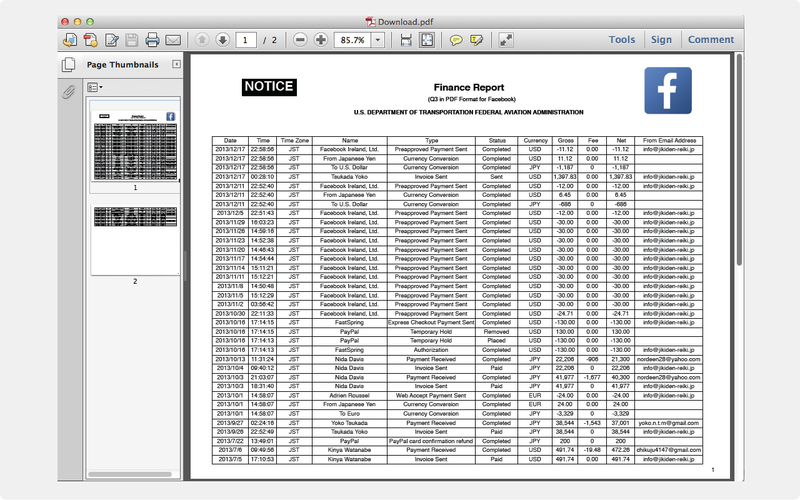 Document all objects in the database or selectively, choose ones. Custom objects annotations. Avoid manual time consuming task of SQL documenting. Let us take this burden and we will carry it proudly. Lashing Calc is a user-friendly lashing calculation program for Ships Officers and Marine Surveyors. It is easily operated using either keyboard or mouse. Lashing Calc complies with the latest UN ECE standards and CSS Code (Annex 13) and can print to all standard printer types. Lashing Calc is a part of Maritime Software Suite along with Draft Survey and Route Planner marine calculation programs. December 14, 2014 Databases & Networks, Software, Software DevelopmentHaikou NoSQLt West-sea Data Technology Co., Ltd.
NoSQLt Professional Edition supports up to 50,000 Tags, which is a real-time / history data platform specially designed for wharfs’ real-time monitoring application, medium-sized test data collection applications, the small-and medium-sized regional data aggregation. It can cope with the data collection and storage of a workshop, a large-scale production line or medium-sized test system, and also provides high-speed data supply capacity. Its core characteristics are stable performance and excellent write rate. 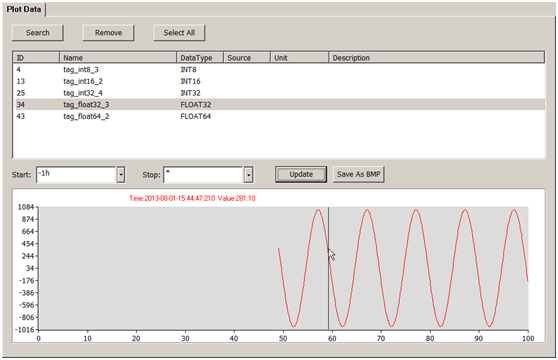 NoSQLt Professional Edition supports up to concurrent 80,000 samples / sec write in (1,000 sampling values / tag / sec), and also provides up to the readability of concurrent 500,000 history values / sec and 200,000 real value / sec. It can provide real-time data storage and real-time data source capability for small- and medium-scale real-time monitoring system. NoSQLt Professional Edition supports 7 * 24-hour unattended operation, windows failover cluster, unlimited history data insertion and complement, and automatic disaster recovery of Network link outages and power down. It has built-in lossless slope compression algorithm, supporting Internet deployment, and access security control precise to every Tag. In addition, it also provides full-featured graphical management monitoring tools, supporting NoSQLt?s unique friendly API, including: true multi-thread-safe access, improving the efficiency of user programs, direct support for csv file, making mapping Tag more efficient, direct support for such friendly time string as -1h, -5y, easy operation, built-in TagValueCache, no more steps after storing data transmission as well as easy deployment and implementation. Please refer to the official website NoSQLt (TM) Professional Edition: It provides a capability of processing 1,000-50,000 tag per second. The purchase price is 999 U.S. dollars per 1000-tag capability. 1000-tag capability is the MOQ and the order quantity shall be the integral multiples of 1000-tag capability. ______________________________ For example, if you need a single set of databases to process 5,000-tag capability, please order five MOQ; if you need a single set of databases to process 35,000-tag capability, please order 35 MOQ. Please indicate in the notes your requirements, so that we will deliver the authorization upon your requirements after the order is generated. NoSQLt_v3.0.2_x86 instructions of update ?JavaAPI is the newly-added member of NoSQLt(TM)API family and NoSQLt(TM) is fully compatible with Java language. ?The function of nosqlt_get_tag_count_by_csv is added to the api of client. ?Notes of partial functions have been optimized. ?The returned value of insufficiency in buffering zone for the function of nosqlt_get_tags_by_source has been revised into -2 from -7. ?The hidden trouble of bug for NoSQLtDog that emerges during initializing has been revised. ?The parameter of IN_OUT int* mss for the api function that reads the historical data has been revised into IN_OUT int* mss. ?The bug that leads to the collapse results from the failure to star the cache when clients? send snapshot to it. ?The bug that leads to the incorrect statistics when covering in the sheet of Hash. ?The interface of NoSQLtTool has been optimized. ?Function has been added to the NoSQLtTool: the monitoring of server performance. NoSQLt Enterprise Edition supports up to 200,000 Tags, which is a real-time / history data platform specially designed for the company-level large-scale experimental data collection applications, and large-scale regional-level data aggregation. It can deal with the data collection and storage of several workshops, a number of large-scale production lines or large test systems, and also provides storage, background computing and high-speed data supply capacity. Its core characteristics are stable performance, balanced and efficient read-write performance, and powerful function. NoSQLt Enterprise Edition supports up to concurrent 129,999 samples / sec write in (1,000 sampling values / tag / sec), and provides up to the readability of concurrent 1,000,000 history values / sec and 1,000,000 real value / sec, which can meet the requirements for data collection, transmission, storage, computation and high-speed supply of the large-scale real-time data monitoring system. NoSQLt Enterprise Edition supports 7 * 24-hour unattended operation, windows failover cluster, and third-party data backup. It has built-in lossless slope compression algorithm and high-speed plot calculation, high-speed bulk history data playback and other functions, supporting unlimited history data insertion and complement, automatic disaster recovery of Network link outages and power down, Internet deployment, and access security control precise to every Tag. In addition, it also provides full-featured graphical management monitoring tools, supporting NoSQLt?s unique friendly API, including: true multi-thread-safe access, improving the efficiency of user programs, direct support for csv file, making mapping Tag more efficient, direct support for such friendly time string as -1h, -5y, easy operation, built-in TagValueCache, no more steps after storing data transmission as well as easy deployment and implementation. Please refer to the official website (TM) Enterprise Edition: It provides a capability of processing 1,000-200,000 tag per second. The purchase price is 1499 U.S. dollars per 1000-tag capability. 1000-tag capability is the MOQ and the order quantity shall be the integral multiples of 1000-tag capability._____________________ For example, if you need a single set of databases to process 5,000-tag capability, please order five MOQ; if you need a single set of databases to process 150,500-tag capability, please order 151 MOQ. Please indicate in the notes your requirements, so that we will deliver the authorization upon your requirements after the order is generated. NoSQLt_v3.0.2_x86 instructions of update ?JavaAPI is the newly-added member of NoSQLt(TM)API family and NoSQLt(TM) is fully compatible with Java language. ?The function of nosqlt_get_tag_count_by_csv is added to the api of client. ?Notes of partial functions have been optimized. ?The returned value of insufficiency in buffering zone for the function of nosqlt_get_tags_by_source has been revised into -2 from -7. ?The hidden trouble of bug for NoSQLtDog that emerges during initializing has been revised. ?The parameter of IN_OUT int* mss for the api function that reads the historical data has been revised into IN_OUT int* mss. ?The bug that leads to the collapse results from the failure to star the cache when clients? send snapshot to it. ?The bug that leads to the incorrect statistics when covering in the sheet of Hash. 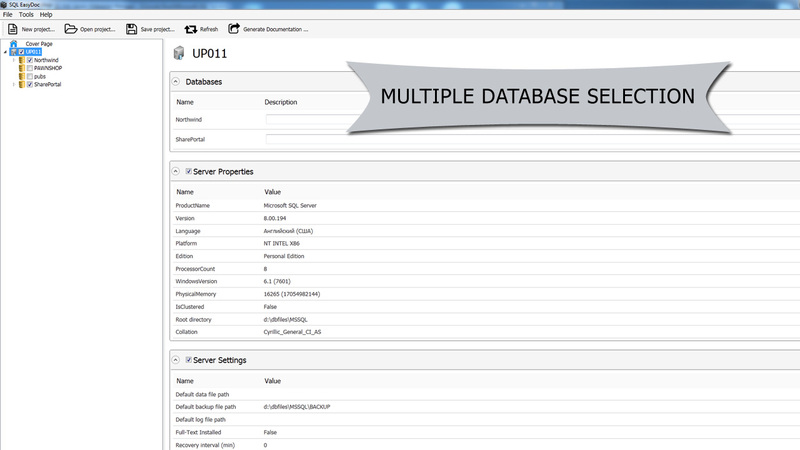 ?The interface of NoSQLtTool has been optimized. ?Function has been added to the NoSQLtTool: the monitoring of server performance. 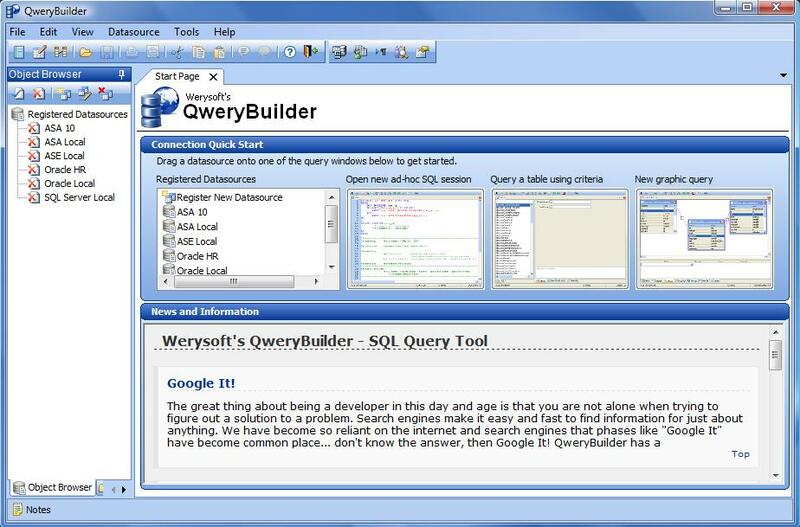 The purpose of QweryBuilder is to make accessing data from a database simple, quick, accurate and efficient. QweryBuilder implements innovative ideas to make this possible. An end user can extract and update data without writing a line of SQL. Best of all, you can do this with your SQL Server, ASE, SQL Anywhere and Oracle databases in one single application. The purpose of QweryBuilder is to make accessing data from a database simple, quick, accurate and efficient. QweryBuilder implements innovative ideas to make this possible. An end user can extract and update data without writing a line of SQL. 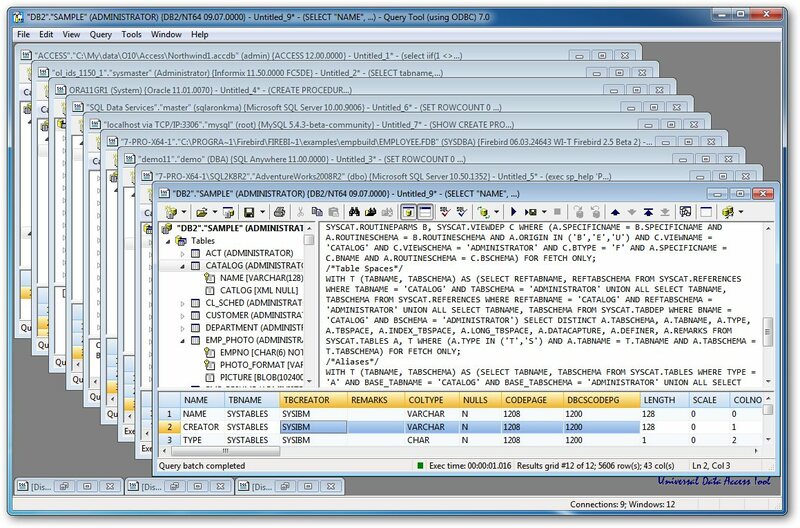 Database developers can create procedures, tables, views and triggers with fewer keystrokes. Best of all, you can do this with your SQL Server, ASE, SQL Anywhere and Oracle databases in one single application. 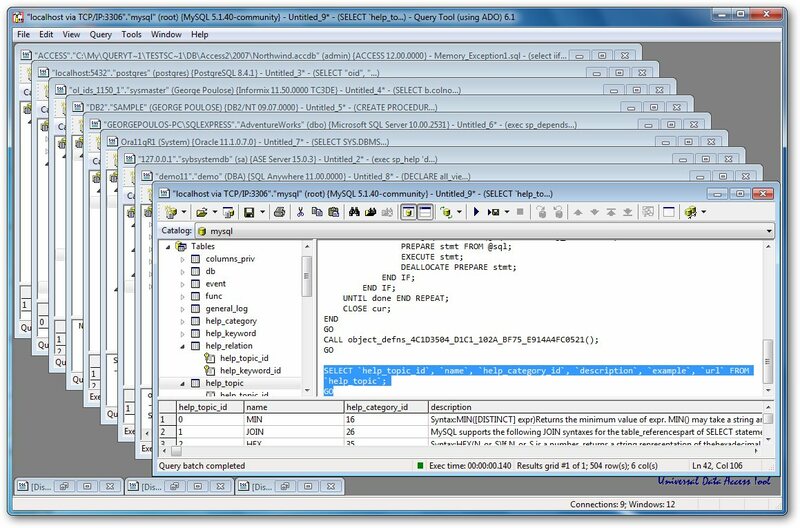 - FREE downgrade to Query Tool (using ADO) 6.1 (32-bit). Query Tool (using ADO) is a Universal Data Access (UDA) tool. It lets you query OLE DB data sources, author SQL scripts and queries, execute multiple SQL scripts or stored procedures simultaneously, return query results to a grid or free-form text, export results in Excel, XML, and HTML formats, retrieve OLE DB provider properties, and more. 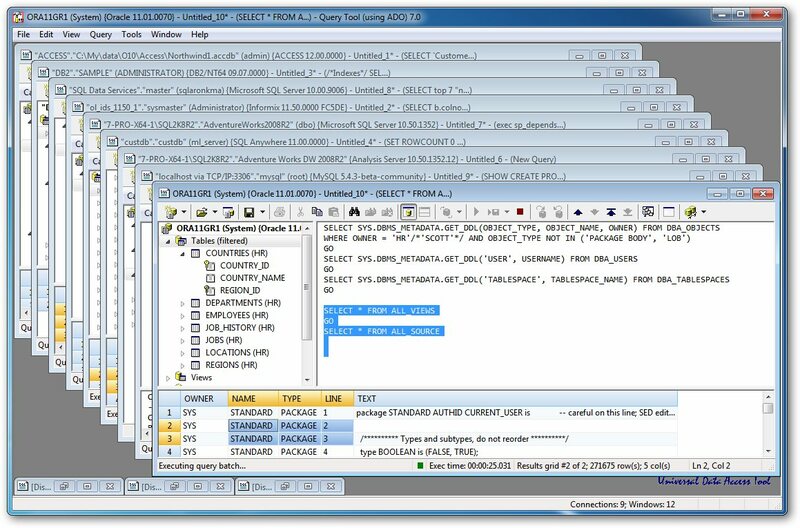 - FREE downgrade to Query Tool (using ODBC) 6.1 (32-bit). Query Tool (using ODBC) is a Universal Data Access (UDA) tool. It lets you query ODBC data sources, author SQL scripts and queries, execute multiple SQL scripts or stored procedures simultaneously, return query results to a grid or free-form text, export results in Excel and HTML formats, retrieve ODBC driver information, and more. - FREE upgrade to Query Tool (using ADO) 7.0 (64-bit).